Punjab Education Minister Sikander Singh Maluka has much explaining to do. Under his watch, rather with the active involvement of individuals hand-picked by the minister, books, some of questionable merit, were chosen for libraries of primary schools in the state. Each year it is becoming more and more heartening to see brilliance across the country on the day CBSE Class XII results are declared. The scores are an improvement over the last year in almost every aspect - overall pass percentage is up 2 per cent and the above-95-per-cent club has grown to 7,231 (up 39 per cent). In the famous parable “The Little Prince” by Antoine de Saint Exupery, the prince observes that humans have a tendency to create a problem and then they make efforts to solve it. In terms of our environmental degradation, we have created more problems than we can ever manage to solve. But some hope seems to be emerging for survival of vultures. For centuries vultures have been silently performing a very important task in keeping the balance of the cycle of nature. LAST week’s cold-blooded murder of a British soldier in broad daylight in Woolwich (south London) by a UK citizen, Michael Adebolajo of Nigerian origin, demonstrates that terrorism does not have to be centrally directed. Coming close on the heels of this is a report that a French soldier was stabbed in a Paris suburb last Sunday. I was taken aback when on return from Chandigarh to my house in Panchkula, I was signalled by cops to stop who brought their face closer to mine to find out if I was drunk. Finding it an unhygienic and unhealthy exercise, I argued with them to test my alcohol levels with an alco-meter. 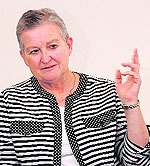 Nattily attired in a semi-formal fashion, donning a black and white summer jacket, the US Ambassador to India, Nancy Powell, is every inch a diplomat who wouldn't be caught on the wrong foot. Business-like and incisive in her answers, however, she exudes a charm that is hard to resist. Punjab Education Minister Sikander Singh Maluka has much explaining to do. Under his watch, rather with the active involvement of individuals hand-picked by the minister, books, some of questionable merit, were chosen for libraries of primary schools in the state. Some of these were overpriced, and the supplier of these books did not have a track record in publishing. There were also issues regarding the orders placed for science laboratory kits ordered for schools. Sarv Siksha Abhiyanan and Rashtriya Madhyamik Shiksha Abhiyan provided the Central funds for the books and kits meant for government-run schools. The government in general and the minister in particular are under fire because of improper procedures. And the bad selection of books is seen as rubbing salt into wounds of the primary school system, which is already bedevilled by inadequate infrastructure, staff and funds. When these books arrived in some schools in Mohali, Ropar and parts of Hoshiarpur, officials concerned found them so bad that they even protested. Not only are some words and phrases of the kind which one would not like children to be exposed to, age-inappropriate subjects, too, were dealt with in these books. The minister could even be accused of not looking after party interests, since one of the books roundly criticises the role of the Chief Minister and other Akali Dal leaders in the 1980s. No wonder, the minister finds himself in the dock and the officials concerned have been suspended. The Chief Minister, alert to the damage the unravelling scam could cause to his government’s image, has ordered a judicial probe. However, the lack of a time-frame in which the inquiry is to be concluded gives rise to speculation that it could be open-ended, as some such inquiries have been. The Education Minister has been quick to point out that choosing people who are on a panel, like the one he constituted for the selection of the books, is his prerogative. He, however, has to face the consequences of his action. He is now in a position where his continuation in office is untenable. Each year it is becoming more and more heartening to see brilliance across the country on the day CBSE Class XII results are declared. The scores are an improvement over the last year in almost every aspect - overall pass percentage is up 2 per cent and the above-95-per-cent club has grown to 7,231 (up 39 per cent). With the large number of students attaining such high scores, it may seem the achievement is not exceptional. That is not so. The toppers in science and commerce have scored 99 per cent. That is about the limit of human perfection, and to think there are two students who have achieved that! If anyone doubted India’s human resource quality, here’s proof. Besides the high scores, it is also reassuring to see the spread of talent and genius, which has shown up in places you would not usually expect. For one, a girl in a hostel - living away from family - has topped in humanities with 98.5 per cent; a boy in the remote Tenga valley of Arunachal Pradesh is second. A completely blind boy has scored 95 per cent in science. He had a tough time convincing the CBSE to allow him to take the science exam; and could not compete for the IITs as the rules didn’t permit. However, he has been able to get admission in Stanford University, California (US). That is a commentary on both Indian and US education systems. Amidst all this cheer, a thought naturally goes out to the large mass of students who stand at various levels below 95 per cent. With high college admission cut-offs, some of them may get a tinge of failure. But they have to realise they are the mainstay of the country, and the simple fact that the mass of jobs ultimately goes to people who are average - if people scoring between 80 and 95 per cent can be called that! Overall development is something the CBSE needs to look at. The high scores in academics may be coming at the cost of other aspects of personality. In the famous parable “The Little Prince” by Antoine de Saint Exupery, the prince observes that humans have a tendency to create a problem and then they make efforts to solve it. In terms of our environmental degradation, we have created more problems than we can ever manage to solve. But some hope seems to be emerging for survival of vultures. For centuries vultures have been silently performing a very important task in keeping the balance of the cycle of nature. They are nature’s scavengers. Till the early 1990s, huge flocks of vultures in the fields or in the dumping grounds were a common site. They disposed of animal carcasses. But in a span of a few years, nearly 99 per cent of Gyps vultures in India and other countries of South Asia disappeared from our ecological cycle. The cause of their disappearance turned out to be a pain-killer called Diclofenac that was administered to animals. In 2001, vulture conservation and captive breeding began in association with the UK-based Royal Society for the Protection of Birds (RSPB). Several Vulture Conservation Breeding Centres (VCBCs) came up with the help of the Bombay Natural History Society at Pinjore in Haryana, Rajabhat Khawa in West Bengal and Rani in Assam. A national-level committee was formed to hold workshops and awareness camps to protect the majestic birds in 2005. The efforts of the Wildlife Wing of the Forest Department of Himachal Pradesh to set up vulture restaurants, where carcasses will be Dilcofenac free is another welcome step. Despite a ban on Dilcofenac, which still has some legal ambiguities, under the Drugs and Cosmetics Act, drugs for animal use are examined by the Directorate-General of Health Services, Ministry of Health, in consultation with the Ministry of Agriculture. There is need for identifying alternative drugs that are not only safe and effective for livestock, but are also safe for vultures and other scavenging birds and animals. Saving vultures would mean saving the ecological cycle. LAST week’s cold-blooded murder of a British soldier in broad daylight in Woolwich (south London) by a UK citizen, Michael Adebolajo of Nigerian origin, demonstrates that terrorism does not have to be centrally directed. Coming close on the heels of this is a report that a French soldier was stabbed in a Paris suburb last Sunday. Like the Boston attack (April 15) during the hallowed annual Marathon run in which two young men of Chechen origin caused the death of three persons and injuries to hundreds, the London and Paris incidents seem to be the handiwork of resolute elements acting on their own. There is no evidence yet that they formed part of a terrorist hierarchy and had been directed by someone pulling the strings remotely .This is a significant trend in the history of modern terrorism in which 9/11 remains a watershed. The London murder triggered a few attacks on mosques outside London. This is an unusual development for a country where the Muslim community had integrated itself reasonably with the rest of British society. While there has been no major flare-up since these minor incidents of racial tension, whether the killing of the British soldier could be looked upon as an act of terror or not is irrelevant. The statement of Adebolajo, caught over video after his savage act that his action was provoked by British soldiers killing Muslims in Afghanistan and elsewhere in the globe, was proof enough that it formed part of a pattern seen since 9/11. Unless the investigation by the British authorities brings out any other information, such as a deranged mind, the impression that has gained ground is that Adebolajo, who is a convert to Islam, fits into the classic definition of a "terrorist". It also establishes that while the West may have succeeded in dismantling any central apparatus of Al-Qaeda following the liquidation of Osama bin Laden, the motivation that went with that deadly group seemed intact. Reports on Adebolajo's activities in the recent past are in support of an assessment that he had strong views on the slight caused to his religion by the West. First, the information that he had been arrested in 2010 in Kenya for suspected membership in a terror outfit called Al-Sabab and later transported to the UK is evidence that he had been radicalized before returning from Kenya after an uncertain period of stay. Following the Woolwich incident, when his picture appeared prominently in the media, many citizens identified him as having been seen in London streets propagating Islam and denigrating those who had defamed his religion. The UK Home Office believes that the country faces high risk from thousands like Adebolajo who had returned after a spell of religious indoctrination and training in some regions of Africa (such as Somalia) and Asia (especially Pakistan and Afghanistan). It may be recalled that the London transport bombing of July 2005 was the work of four UK citizens of Pakistani descent who had received militant training abroad. This is a universal pattern that law enforcement and intelligence agencies in India too should be aware and may have already taken suitable counter-measures. The only difference is that while in the West, especially the UK and the US, return of such fundamentalists is through normal immigration channels after practising deception on the authorities, we in India have thousands of illegal infiltrants who take advantage of our ridiculously porous borders both with Pakistan and Bangladesh and sneak in either to secure gainful employment or perpetrate terror. The London and Boston incidents have one common feature. One of the perpetrators in each had been known to some of the security agencies. The FBI had been warned by their Russian counterpart that Tamerlan Tsarnaev had been radicalised during his visit to his native Dagestan before he returned to the US where he was living on a green card and was awaiting citizenship. He was questioned by the FBI which found nothing objectionable and let off, following which he went out of the FBI radar. In the recent UK episode Adebolajo was known to the MI5 (equivalent to our IB) as a religiously motivated dangerous person. Still the evidence against him was not sufficient to detain him. These two instances would show how a resolute and clever individual with terrorist leanings could mask his intentions and strike at a time of his choice. There is behind this tricky situation the traditional debate between security and freedom coupled with privacy. Can you apprehend and neutralise a person with extremist views if he has not indulged in overt acts of terror without infringing the right to liberty? The correct balance will never be achieved, and this inability of governments to make up their minds has attendant risks to citizen's safety. President Obama now faces such a dilemma. He believes the time has come to put an end to hostilities in terror-affected areas such as Libya, Syria, Pakistan and Afghanistan. The extensive use of drones by the US has invited such ire that it poses imminent danger to that country's domestic stability. The President has spoken in terms of obtaining legal authorisation for employing drones. This is a proposition that has many complexities. Equally problem-ridden is the promise to close down the infamous Guantanamo Bay detention centre. Holding thousands of foreign nationals on dubious charges of terror has been found to be untenable. Whether the President will ultimately come down to ending the infamous Guantanamo exercise is anybody's guess. Both issues — the use of drones and keeping Guantanamo going — have their own impact on the terrorist scene. They give ammunition to those who want to strike at the US internally. Identifying such elements within the country is a task that the FBI and the CIA are grappling with. Success here is uncertain as the Boston episode would reveal. The cops had a ready answer that they were trying to minimise harassment. Whether it was to mitigate the sufferings of commuters like me or a lame-duck excuse, I found it annoying. Many friends have similar embarrassing experience before their family members. companies — drink a bottle of wine a week on an average, around 11.2 units, compared with 6.2 units for female hairdressers, cleaners and factory workers. And the easy availability and a low price of supermarket booze have led to more housewives drinking to excess at home. In our own Chandigarh, I found to my pleasant surprise the other evening that over 50 per cent of those having booze at the recently opened first Sports Bar at what is touted as the largest mall of the city were women. While I have nothing against male or female drinking patterns, I wish those in dangerous avocations like drivers of trucks, buses and cabs and pilots must refrain from drinking while performing their jobs as they risk lives of others. Shockingly, even Indian skies are getting dangerously full of tipsy pilots and cabin crew as Aviation Ministry figures suggest a marked increase in the number of crew members found drunk while reporting to airport for operating flights. As many as 45 were caught this year as opposed to 15 last year. The number of pilots who failed the breath analyzer test rose from four to 14 and the cabin crew number jumped from 11 to 31 in January-March over the same quarter in 2011. I found an apt answer to the tricky issue on the road itself when I visited my hometown Abohar recently. A board put up by some spirited people suggested, “If you must drink and drive, drink milk or else form neighbourhood home clubs." The advice coming from the land of milk and lassi can surely be a panacea for all! Nattily attired in a semi-formal fashion, donning a black and white summer jacket, the US Ambassador to India, Nancy Powell, is every inch a diplomat who wouldn't be caught on the wrong foot. Business-like and incisive in her answers, however, she exudes a charm that is hard to resist. Even when she circumvents answers to vexing issues like Kashmir you can't help but admire her sharp wit and sense of humour. On a special visit to The Tribune office yesterday, the charming lady talks to the senior editorial team about a host of issues ranging from Afghanistan to Indo-US relations to Pakistan and of course on being the first woman US Ambassador to India. How do you look at Indo-US relations currently? I would divide it into three broad areas. First, there is a focus on bilateral relations across the board with particular emphasis on economic ties which we will be elaborating upon next month when Secretary of State John Kerry arrives for the third annual Indo-US strategic dialogue with External Affairs Minister Salman Khurshid. It will highlight the depth and breadth of our relationship. The second area is recognising that India is a growing power in the world stage, certainly in the region, and how does the US engage or work with India at various regional and international fora. And the third area of the broad picture is on security and counter terrorism which includes sharing of intelligence and the Homeland security dialogue. With regard to the security issue, the US plans to pull its troops out in Afghanistan in 2014. How does US view the region and India's role in Afghanistan? 2014 is an important year for the region for a variety of reasons including general elections in Nepal, Bangladesh, India and Afghanistan. Then there is a decision by the US to basically decrease the number of boots on the ground in Afghanistan. But we plan to continue to assist and train the Afghan national security forces. India has been performing a small but very important piece of training of some of the Afghan Security Forces, both its Army and Police. We hope that this will continue and we can have a coordinated approach. We began a bilateral dialogue with Afghanistan. We invited people from Washington and Kabul to come here and brief your officials apart from understanding what India was planning as well. That has also now developed into a trilateral dialogue with Afghanistan, India and United States sitting down. This is a sign of the positive role India can play in the region. I think your soft power is potentially very important for Afghanistan, particularly the examples of how your parties organise themselves, how they fight elections apart from some of the constitutional mechanism that you use for conflict resolution rather than resorting to battles. I think in a variety of ways we can work together with the Afghans and we are all hoping that our cooperation will increase after 2014. What is the US perception on Kashmir? The US is united with India and other countries in condemning terrorism. There is an active sharing of information between the two countries, active diplomacy with Pakistan and other countries for India and Pakistan to continue their dialogue. The Homeland Security dialogue covers an enormous range of issues. The levels of violence in the Valley have gone down if not disappeared completely. There is an appreciation that as long as there are incursions along the Line of Control, there is a potential for escalation of violence which is not in the interest of the world. But we are steadfast in saying that this is a problem that India and Pakistan should solve on their own and we will be helpful only if both parties ask for it. Will you explain President Obama’s new approach to combating terror? I am still digesting what the President had said last week, I think it will be an area of debate and I think what he was explaining was instead of having a broad global war on terror we are going to look much more precisely at those areas where there are significant problems, work to address those and devote our resources in a more focused manner. I don’t think any of us believe that the war on terror is over or those who declare war on us have completely abandoned this fact. I would not think terrorists can take any comfort from the change in tactics. With Nawaz Sharif all set to take power on June 5 as the next premier of Pakistan how do you look at the hand of friendship that he has extended to India? Do you think the army there will welcome this? There has been recognition in the United States that welcomes the comments of both the Indian Prime Minister Dr Manmohan Singh and Nawaz Sharif. It is very significant that Pakistan has had elections and will now go from a democratically elected government to another one. It is an important milestone for Pakistan. During my stint in Pakistan the people to people interaction was seen as a very positive development. Pakistan has energy needs and there could be a mutually beneficial way of India addressing these. The lowering of tensions is positive and any Pakistani would see it as a plus. But as an American and sitting here in India, I shouldn't be saying that. Are you disappointed with the progress in India-US business relations? Well, I am an American and I obviously like to race ahead. On the overall relationship we are going to cross the $ 100 billion mark in trade in goods and services this year. This is an enormous increase but it is basically done by our companies or individuals working together. I foresee that will continue. We are hoping to negotiate a bilateral investment treaty. We pulled back and built a new model and about the time we finished our new model, India said its time to look at ours. Both are legitimate moves as the world had changed. There are calls among the business communities on both sides to perhaps skip this and look at a free trade agreement. Those are the ideas that we will explore in this dialogue and I think we will begin to see the trade policy forum regain its periodic meetings to discuss trade issues. On the nuclear deal are you concerned by the slow pace and that US companies haven’t benefited so far? US does have issues with the Nuclear Liability Law of India and we are concerned about how it will make it very difficult for the US companies from coming to India. Yet we are working very closely and hopefully there will be a way forward on outstanding issues. On the commercial question, Westing House senior officials were in Mumbai last week and we are hoping to see some progress. When Barack Obama took over as the President he stated that the US is losing jobs in mathematics and science to India and China. Why are Americans lagging behind? (Chuckles) Guess we got lazy a little bit. It is hard work to do those subjects and I think we were able to continue to find people particularly from this part of the world who were willing to come and use our very open economic society to prosper and many of them have become American citizens. Science and technology had become almost a totally male dominated field but that is no longer true. These subjects are very important for both countries. It is going to continue to be an area where there is an enormous demand for knowledge, innovation and a real emphasis in the United States. In open societies we need open business models that allow people to exchange ideas. India had a strong association with the US as far as students studying abroad were concerned? But now Indian students are looking at other countries like Australia and UK? It's possible that there is a growing demand in other countries but in United States we are still seeing an increase in numbers. American educational institutions are delighted to have Indian students and we are working hard to have them. What do you think of the India's misgivings over the US Immigration Bill? It is a very complex Bill which is thick document and is likely to be amended many, many times. But there are positive things in store. Students who want to do science, technology, maths and engineering it means a big welcome and a green card at the end of the day. Rest-assured, the number of HI-B visas will go up and those in the pipeline for legal immigration will have cause to cheer as the hugely debated Bill will have some staggering proposals. 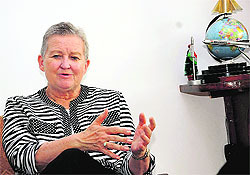 As the first woman US Ambassador to India, do you think it's an advantage to be woman in India? It's always a big advantage to be a woman not just in India but anywhere in the world. But you have to work at it. We are all doing better but could do more. In India it's heartening to walk into a room and realise that I am not the only woman in that room. Certainly she takes pride in being an American and in staying ahead. But equally interestingly she also calls herself "Punjabi American" as she grew up close to the soil in the agricultural part of the United States and the sight a of tractor in India makes her feel at home. What she admires in Punjabis is their community spirit and how they look out for each other. Besides, she enjoys talking and listening to farmers. Emergence of women as role models is something that she finds very encouraging. Lest we forget… the lady herself who occupied the prestigious position of the director general of the United States Foreign Service, had served as an Ambassador to Pakistan and Nepal and held many more significant posts, is undeniably an inspiring example worthy of emulation.